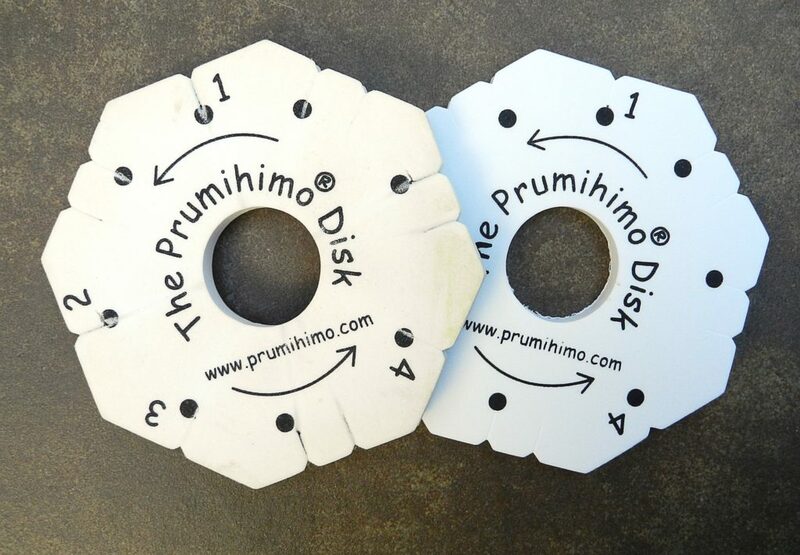 The Prumihimo disk is made of high density foam, which is designed and tested to give good performance and a long life to your disk. However, in order to allow the cords to be inserted into the slots the material needs to have some give and over time and with repeated use your disk will show signs of wear. Ultimately it will need to be replaced, but certain measures will help to prolong its life and maintain its satisfactory performance. The most important issue for beaded braids is the condition of the slots for the thinner cords. It is strongly recommended that the top and bottom slots at numbers 3 and 4 are reserved for thin cords of 0.5mm or less. By doing this you will ensure that the slots are able to grip the cords and maintain tension in the braid. If wider cords are used the slots will become stretched and when narrower cords are used they will slip in the slots causing uneven tension and a frustrating braiding experience. If you wish to experiment with much thinner cords than 0.5mm it is best to use a new disk and keep this disk just for the very finest cords. The printing on the disk will wear out in some places over time on a well-used disk. The dots will be the most obvious place where this happens. This was taken into account when I designed the disk. When I tested different locations for the dots I found that it was confusing to have the dots anywhere other than at the end of the slots. Some wear on the dots is therefore inevitable, but they will remain visible even after extensive use, so the decision was made to keep them in this position. Anything white will get grubby and discoloured after a while, but the disk can be washed gently with soapy water. Just leave it to dry naturally somewhere warm. Do not put it anywhere hot or use a source of heat to dry it. Certain materials may cause staining. Cheap ribbon can often prove not to be colourfast and it will stain the area around the slots. Some beads have a chalky, coloured residue in the holes and this will cause staining on the disk and cords. If this happens, wash the disk, paying attention to the inside of the slots. A soapy cord can be pulled through the slots to clean them. After washing some colour stain may remain, but it shouldn’t transfer to cords. However, if you plan to use a pale and expensive cord on a stained disk it is worth testing with a sample length first. Eventually, extensive use of a disk will cause the slots to loosen, even when you have followed the guidance above. It is then time to consider getting a new disk. However, this is now a good opportunity to experiment with wider cords or wires. Try novelty yarns or have a go with really big beads. An old disk is never rendered useless by being over worked, it just opens up new ways to experiment!